Direct Gold BBS Touch Up Paint!! Or just paint your silver wheels Gold BBS. NOTE: Paint can only be shipped in the lower 48 states and cannot be shipped in the air. Please select the fedex ground shipping options only! it is finally here! We personally know that when you damage those beauitful gold BBS rims it is impossible to find a paint that is an exact match so you end up with the whole world knowing that you rubbed that extra high curb. 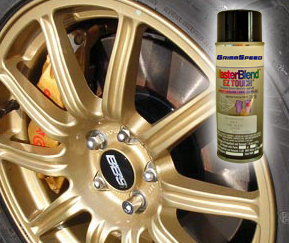 Well now you can spray a bit of our "GrimmSpeed Gold" Wheel Paint on them and they will look like new! And for all of you that don't have BBS wheels, well now you can paint your wheels the same color as the BBS wheels. Being Subaru owners ourselves, we are all addicted to the gold look but it is impossible to find a good gold color at your local paint/auto parts store(especially one that is even remotely close to BBS gold). Search no more! The paint is an acrylic enamel. Essentially one of the most durable single component paint available (paint able to be sprayed out of a rattle can). We now offer a specially formulated GrimmSpeed Clear Coat for use with our color matched paints! To add more than one can to your order, please visit the product page (CLICK HERE) and add as many as you need to your cart.